The first things people ask us when we tell them we co-authored a book are: how does that work? How do you split up the writing? How do you remain friends? We figured out the right balance and process through trial and error. A lot of what we tried didn’t work! But after a few chapters, we found a good rhythm. Here are six tips we recommend to other co-authors. This helps the workload feel equitable. As another co-author shared with us, “When you have two authors, each does 90% of the work.” Because you are extremely aware of much time you’re spending not only writing but thinking and editing, it’s easy to assume you’re working more than the other person. The first draft requires a lot of heavy lifting, so it’s a great opportunity to create a feeling of fairness by alternating who takes the first crack at teach chapter. One of us (“Partner A”) starts by doing a chapter outline. The other person (“Partner B”) reviews the outline and adds in any topics that are missing. Next, Partner A writes the first draft over the course of about two weeks. Partner B then gives feedback on the first draft, and then Partner A incorporates these edits into the draft. Which brings us to tip number two…. Ahead of these meetings, Lisa gave us a list of questions publishers might ask: Who do you think is your main audience for the book? If you’re aiming for a millennial audience, what is the irresistible promise for that reader? 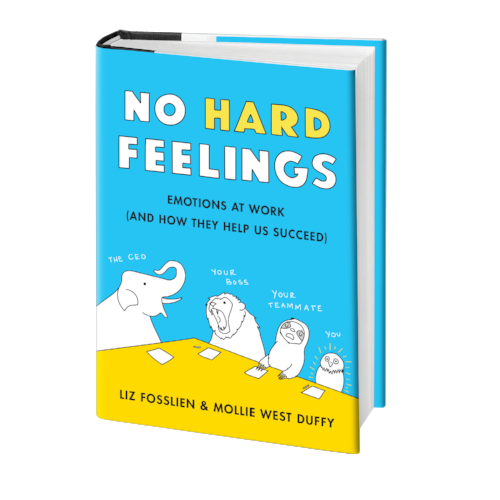 Are you suggesting that we change when and how we have emotions at work-- or just suggesting that we change how we talk about them? When you say, “embracing emotions at work,” are you suggesting that it’s okay for people to get angry and yell at others? What marketing ideas do you have for promoting the book? Designing our book cover was so much fun! We chose to work with our publisher, Penguin Portfolio, because they agreed to let us collaborate with us on the cover-- many publishers don’t allow authors (even illustrators!) to be part of the design process. In the post, we’ll show you how we narrowed over 20 designs down to one.